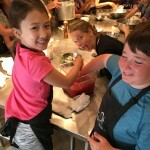 Summer cooking camps at TST are designed to let kids thrive in the kitchen by giving them every opportunity to get their hands dirty and learn by doing. Campers work in small groups to prep, cook, and eat regionally-themed meals in a family-style setting. 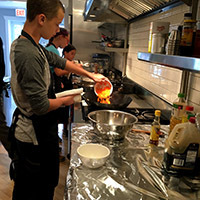 With the guidance of our chef-instructors, young chefs will hone a wide range of culinary technique, taste novel ingredients and dishes, learn the ins-and-outs of managing a kitchen space, and most importantly, experience the joy of cooking and eating with friends. All levels of experience are welcome. 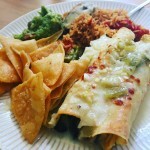 There is something for everyone at The Social Table! Over the course of the summer, we will offer a total of 12 distinct menus featuring cuisines from around the globe (including your backyard). And good news: your child can take any classes they want and in any order–just 1 or all 12! TIME: All classes run 10am-1pm, Monday through Friday. 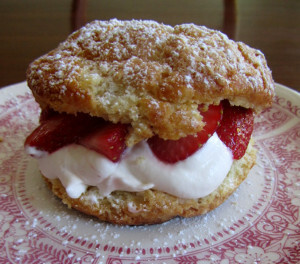 Lunch will be served! AGE: This program is best suited for ages 8-12. We will offer a special “Teen Week” in August for ages 13+. More details coming soon. 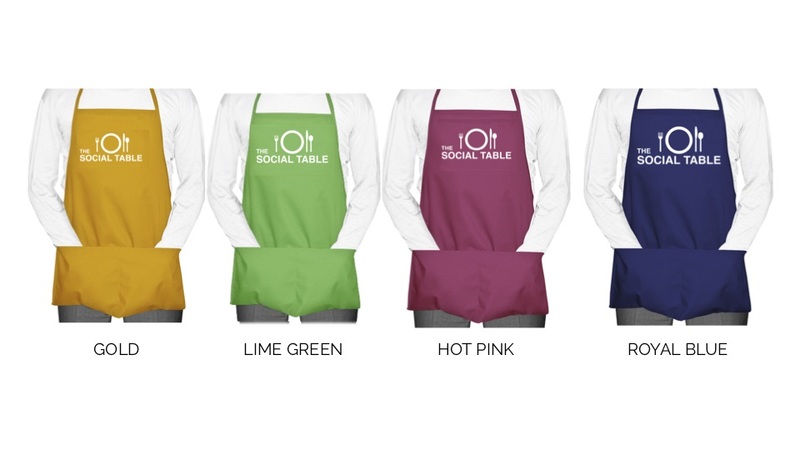 ADD-ON GEAR: All necessary materials will be provided for class time, but if you want your very own apron and knife to take home with you, purchase below and pick up on your first day! Who will drop off & pick up your child from camp? I, the undersigned, fully understand and acknowledge that culinary activities such as those offered by La Ripa Operations, LLC dba The Social Table (“The Social Table”) have inherent risks, dangers and hazards. I understand and acknowledge that my child’s participation in these types of activities may result in injury, discomfort or illness, including, without limitation, cuts, burns, food poisoning, slipping and falling, and any other personal injury. I have read and fully understand this waiver and in consideration of the acceptance of my entry, for myself and my child, I waive and hereby release The Social Table, its members, manager, owner, agents, employees and instructors and their respective successors and assigns from any and all claims, liabilities or causes of action, including without limitation, death, bodily injury, property damage, or other losses, damage or inconvenience, whatsoever, that may result from participation in events held on the premises. I understand that The Social Table reserves the right to take photographic or film records of any of its programs or events and hereby agree and grant my permission to The Social Table to use my name, photograph, likeness, voice and/or video and to otherwise distribute these images for advertising, promotional and commercial purposes, including, but not limited to on-line, signage, posters, television, magazine articles, websites, social media sites (including, but not limited to Facebook, Instagram and Twitter) and any other publication, at The Social Table’s sole discretion, worldwide and without any limitation and without any compensation, consideration or other remuneration to student/participants, except where prohibited by law.